Freelance graphic designer. Music obsessed. 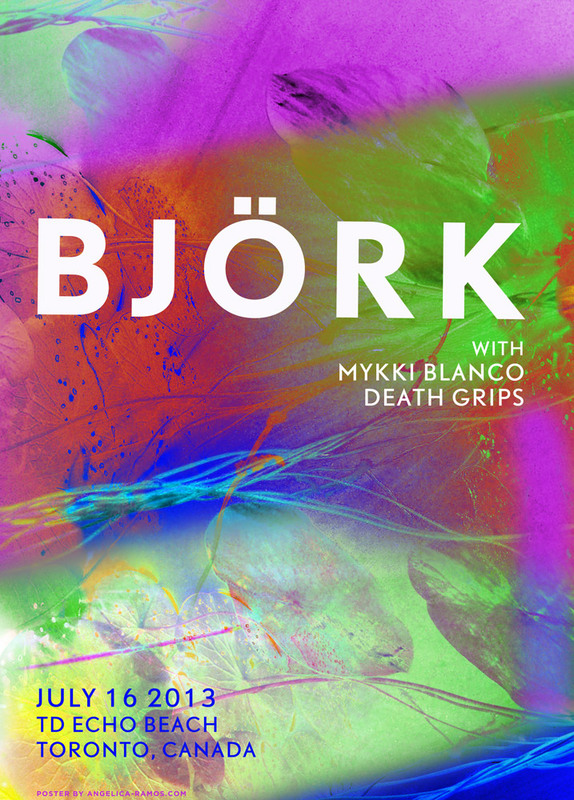 Last Tuesday I had the pleasure of watching Bjork live at Toronto Echo Beach, her performance inspired me to design this poster and to share my impressions. Bjork’s concert is an art performance in which she plays with two main concepts; nature and technology. Most of show is accompanied by stunning animations of nature; we see a colony of starfish at super-fast speed while we hear Hidden Place and witness as electric rays are being created by a huge Tesla coil at the top of the stage to the beat of Army of Me. Seems that while we’re constantly reminded of nature, it is technology that does the trick and plugs us in. Bjork’s presence onstage is impactful beyond her eccentric appearance; a long sleeved super-glittery electric-blue dress and a huge orange wig could not overshadow her voice. Experiencing her voice live impacted me with a whole other level of intensity, recordings do her no justice, her singing is so potent that it casts a spell touching something deep and mysterious. As you would expect, Bjork is accompanied by incredible musicians too. An awesome percussionist, Manu Delago who delivered one of my favourite moments of the concert by playing a beautiful song on the hang drum, he also played an electric drum kit and a marimba. Also notable, the choir Graduale Nobili a bunch of Icelandic girls, 24 of them to be precise, dressed in shiny tunics supporting Bjork with their backing vocals and their intense dance moves. Finally, the dj/computer/ipad player Matt Robertson who had the ability to transform the concert into a rave remixing the end of Hyperballad with LFO’s Freak and into Pluto. On our way out of the venue, away from the crowd and heading back to the city, we were walking through Lakeshore Blvd and had the chance to stand on a bridge and overlook into Lake Ontario. It was so dark we couldn’t tell the sky from the water, the only lights being provided by the half moon and its reflection on the lake and by two kayaks holding a flashlight, sliding smoothly through the water. It was very silent but I could still hear the music in my head, Bjork certainly has the perfect soundtrack for a gorgeous evening in the hot Toronto summer.